No. 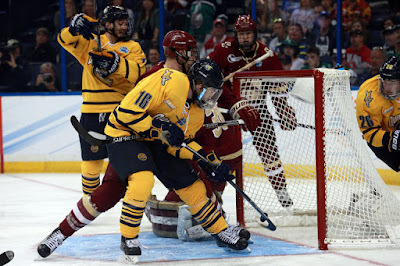 15/15 Quinnipiac returned to the friendly confines of High Point Solutions Arena after more than a month away and they had the look of the team Quinnipiac fans are used to seeing on Friday night in a 4-1 victory over Colgate. Quinnipiac was aggressive, hungry and played with energy and a passion that had been missing for more than a month. For the first time since mid November, the Bobcats won back to back ECAC games when they won four straight in league play. 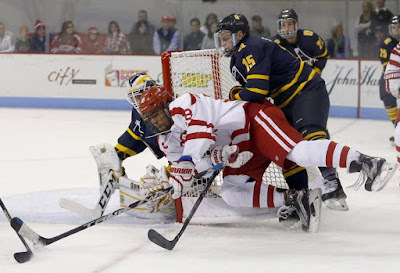 It was a key win for Quinnipiac to maintain third place in the ECAC standings with 17 points. They have, however, played the most league games of any team with 14 so many teams have games in hand on the Bobcats down the stretch. The biggest change for the Bobcats was the decision to start freshman goaltender Andrew Shortridge in back to back games for the first time this season. He was very solid last week in the win against Dartmouth and in relief of Chris Truehl against Harvard last Friday night. Quinnipiac was the more dominant team early in the first period dictating the pace of the game. Midway through the first Colgate started to find its legs and fight back a bit. The Bobcats opened the scoring 12:47 into the first period when Landon Smith drove to the top left circle and sniped a wrist shot far side past Raiders goaltender Colton Point for the 1-0 lead. Kevin Duane and Kārlis Čukste assisted on the goal. It was a clean first period with no penalties called on either team. The Bobcats out shot Colgate 16-8 in the opening frame. In the second period the Bobcats were fantastic cleaning up on rebounds on Colton Point. Just 4:47 into the period Brogan Rafferty drove to the net and his shot was initially saved by Point but Bo Pieper was there to clean up the rebound for his 8th goal of the season. Rafferty and Kevin McKernan picked up the assists. A little under four minutes later, it was the Bobcats again cleaning up in front of the net when Luke Shiplo put one home after Point made the initial save on Čukste's chance. It was Shiplo's 4th of the season and was also assisted by Tommy Schutt. Colgate got a power play chance eight minutes later and capitalized when Jared Cockrell got a shot off through the Quinnipiac defense and past Shortridge for the goal to the cut lead to two goals. The Bobcats responded to the Colgate power play goal less than a minute later when Tanner MacMaster tapped a shot out of the air off a Point rebound for a 4-1 lead. It was Chase Priskie's initial shot that gave Point trouble as he and Craig Martin were credited with the assists for the Bobcats final goal of the game. Quinnipiac out shot Colgate 15-10 in the middle frame. 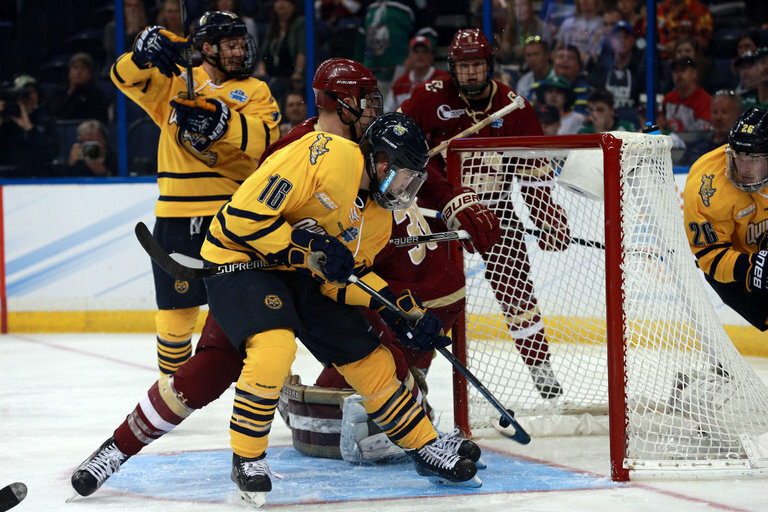 In the third period, the Quinnipiac defense suffocated the Colgate offense, limiting them to only seven shots. While the Bobcats didn't score again they did put 18 shots on goal in the period. Andrew Shortridge was strong in this game for the Bobcats making 24 saves whole Colton Point had 45 saves for the Raiders. Quinnipiac out shot Colgate 49-25 for the game and 100-49 in two games against Colgate this season. Even with the win the Bobcats dropped one spot in the pairwise from 18th to 19th. They return to action tomorrow night against Cornell who is 13th in the pairwise. It is an important game for the Bobcats for ECAC and pairwise implications.